Hotel University Bologna – Things to do in Bologna - An outline of some of the main attractions of historic Bologna. The hotel is close to the famous Two Towers of Bologna, and many of the beautiful churches that adorn the historic Red City. You won’t be short of Things to Do in Bologna, and there could be no better place to relax at the end of an exciting day than this great value hotel. 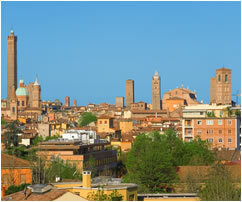 The Hotel University is in one of the most beautiful cities in Europe - Bologna. Located at a vital crossroads in Emilia-Romagna in northern Italy, Bologna has been one of the most important cities in Europe for over a thousand years. It boasts the very first university in Europe, a fact that long ago earned it the moniker La Dotta, or ‘The Learned City’. Visitors come to marvel at its famous red buildings, the Two Towers and many churches. The beautiful porticoes that line the streets ensure shade from the hot Italian sun, and the gastronomic capital of Italy proves itself a wonderful place to dine out in when night comes and the city’s restaurants fill with cultured diners. With the exception of Venice, Bologna offers the visitor some of the most important historical monuments in any European city. Famous for its Two Towers, Bologna once had over a hundred such buildings, probably used for defensive purposes and built by the prominent families of the time. The Famous Asinelli and Garisenda Towers that dominate the central skyline date from the early 12th century, and are a phenomenal sight to behold. The Piazza Maggiore, surrounded by palazzo was created around 1200 and must be one of the finest squares in Europe. Common to every historic Italian city is a great number of churches, and Bologna is no exception. The Basilica of San Petronio is huge, and the cathedral of San Pietro is beautiful, a real sanctuary from the busy Bolognese streets. The University was a vital part of the intellectual life in the middle ages, and Bologna remains very much a university town. The hotel is perfectly located for any scholars looking for a place to stay for academic conferences near the university Bologna. The city retains a youthful air during the university year, and the seat of learning became famous as a bastion of the post-war Left, adding extra meaning to one of Bologna’s nicknames, La Rossa. Former members of the university include Dante, Copernicus and Marconi. Bologna is also a UNESCO City of Music, an accolade justified by the many wonderful concert and operas available to take in. The reception also provides internet access and telephone, fax and copying services. Staff will be pleased to assist you with any travel arrangements or excursions you would like to make, and also to ensure you are familiar with your surroundings by providing a city guide and any further suggestions for shopping and eating. The University Hotel is a perfect base for the keen shopper in Bologna. As you would expect from a city known as La Dotta, there are many bookshops, galleries and antique shops. The food markets are handsomely stocked with the area’s famous foodstuffs and wines., and Italy’s famous fashion houses and designers have stores in the Via Farini and Galleria Cavour arcade. Usual shopping hours are 9.30 to 13.00 and 1500 to 2000. If you feel the need to leave Bologna to explore the beautiful countryside of Emilia-Romagna, there is ample opportunity to do so. Wine connoisseurs will appreciate a wine tour in the Apennine Hills, and nearby Ravenna is similarly beautiful. The surrounding coastline is also perfect for any sun worshippers. Remember, staff at the University Hotel are pleased to help with any further information to help you enjoy your stay in Bologna. In addition, visit our Useful Links page to obtain other information. The region of Emilia Romagna is renowned for its cuisine, including the famous Bolognese sauce, Parma hams, parmesan cheese, handmade pasta, sausage and balsamic vinegar, all vital components to the national diet. Understandably, as its capital, the city of Bologna boasts many restaurants that excel in catering, using these local ingredients to satisfy the discerning palate.